I remember the day in 6th grade when I nervously sat in the principal’s office at Miller Creek Middle School, awaiting the inevitable sentencing for some minor offense I’d committed during recess. When the principal finally came in, she caught me staring at a black and white sketch with the frog gripping to the bird’s throat pinned to her door. Ms. Shepard fixed her eyes on the same picture, and we both just studied it in silence. It was awkward. The school principal – my judge and jailer – inviting me to share some tacit truth about life. Finally after a few moments of intolerable silence, she began to nod her head, and a wickedly mischievous grin broke out on her stone-cold white face. “Allen,” she said. “You’d better learn something from this moment.” I remember the decisive intention in her voice. I had been expecting a blow from a fire-breathing dragon, but instead got a lesson in life from a caring teacher. I received a rather light sentence: Two hours of garbage pick-up and a phone call to my parents letting them know I’d been a naughty bugger. Twenty years later that image of the frog holding on to dear life, the shared silence between Ms. Shepard and I, her advice that I’d best get my sh*t together and persevere in life. It all makes perfect sense to me now. 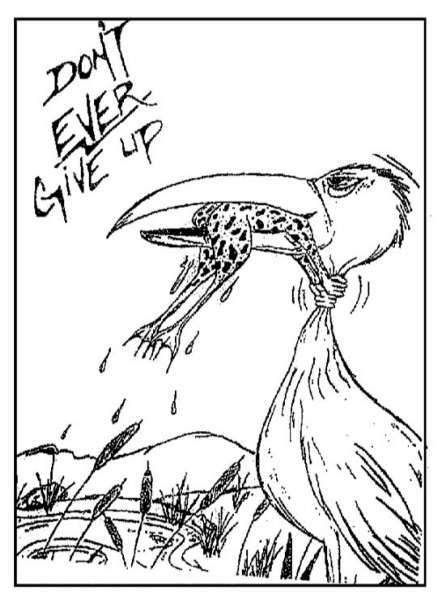 Don’t Ever Give Up!